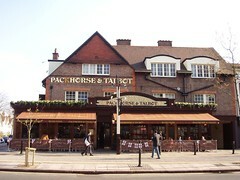 Pub on Chiswick High Road. Bob visited at lunchtime and had an okay gammon and eggs (£7.50). They had Pride on at £2.76, and there were also a couple of other beers which were on at £2.78. Lemonade and lime was £2.10. A sign seen outside in November 2008 advertised live jazz from 7pm on Sundays. Last visited by Bob, 14 May 2008. Last edited 2013-05-10 07:43:35 (version 8; diff). List all versions. Page last edited 2013-05-10 07:43:35 (version 8).